The Nigerian Air Force (NAF) Chief of Air Staff (COAS) Air Marshal Sadique Abubakar confirmed that the NAF is expecting the delivery of three JF-17 multi-role fighters from Pakistan Aeronautical Complex (PAC) (defenceWeb). These will accompany six Mi-35N assault helicopters and three EMB-314 Super Tucano close air support (CAS) aircraft from Russia and Brazil, respectively. In September, during the Africa Aerospace and Defence (AAD) air show, the Government of Nigeria and PAC signed a memorandum-of-understanding (MoU) for the purchase of an undisclosed number of JF-17 lightweight multi-role fighters. It had seemed that the MoU would be a prelude to a final contract, but during the 2016 International Defence Exhibition and Seminar (IDEAS), which took place in Karachi from 22 to 25 November, the term “MoU” was used to refer to inked contracts. With the NAF COAS essentially placing three JF-17s within the NAF’s procurement pipeline, it appears that the contract was signed at AAD. 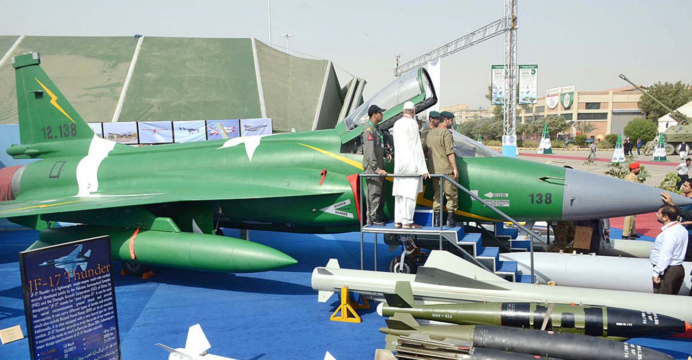 PAC will be supplying the JF-17s along with 10 Super Mushshak basic trainers, which the NAF ordered in June. In August, the NAF Chief also called upon Pakistan to provide training and capacity building support in various domains, such as the NAF’s special operations forces and flight training. In fact, PAF pilots will be joining the NAF’s 310 Flying School to help train future NAF pilots.